A young leader in the Australian beef industry has been announced as the winner of the prestigious CM Hocking Memorial Scholarship from Herefords Australia. Aleacea Nixon, of Queensland, receives the scholarship bursary to undertake studies to benefit the Australian Hereford industry. The scholarship embodies the love of Herefords and a keen interest in youth by the late Mrs Madge Hocking, Oakdene, Ocean Grove, Victoria. Aleacea, 18, is the daughter of Aderian and Julie Nixon, Weetalabah Herefords, Dulacca, Queensland. She was named as the 2018 Queensland Youth Ambassador, sponsored by the Herefords Queensland Association, and sashed as the champion parader, champion herdsman and overall national champion at the 2017 Herefords Australia National Youth Expo. Aleacea has been involved in the showring and cattle industry all her life, helping out with her mother’s fitting service and showing cattle for Wallan Creek, Yagaburne and Cootharaba studs. “I literally have sat beside the ring in a pram as mum judged – I have grown up amongst it,’’ she said. “Both of my parents won overseas exchange trips through Hereford Youth and were involved on youth committees in NSW and Queensland. “They have brought up myself and my brother Lyall the same way – I started at five and my brother at three in the pee wee classes. “They always told me to keep showing cattle for as long as you enjoy it. Aleacea established her own Hereford and Gelbvieh stud, Micky Mouse, in 2015 using Weetalabah genetics. “My grandfather gave me the nick name Mouse and logically it came to me that Mickey Mouse in this country means fantastic,’’ she said. Aleacea loves the Hereford docility and ease of management. “I have two cows, half a dozen heifers and have sold a Hereford bull, Mickey Mouse Lochness, at the 2017 Wodonga National,’’ she said. “My uncle said he had never seen me smile so much in my life when the bull sold. Aleacea has just finished her first year in animal science at Charles Sturt University and has been accepted into the University of New England, Armidale, to further her animal science degree. 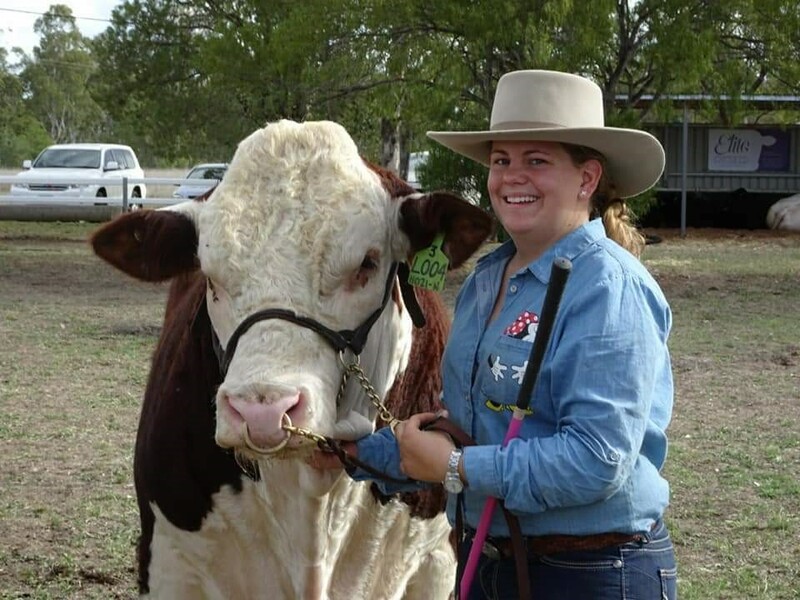 She began serving with Herefords Australia Youth at an executive level at the age of 15 as sponsorship officer for the Herefords Queensland Youth Association. Aleacea was elected as secretary in 2017, plays a major role in co-ordinating the youth show in Pittsworth, Qld and enjoys mentoring younger cattle handlers. She said youth membership was strong and growing in Queensland, with the millennial generation having a real passion for Herefords. She paid tribute to the support from senior members at a state and federal level, and youth co-ordinator Katelin Davies in particular. Aleacea lists her career passions as animal health and nutrition. “Winning the CM Hocking scholarship shows my hard work has paid off and my love for Herefords shines through,’’ she said. “I really want to work on developing rations and feeding programs at feedlots to showcase what Herefords can do. “In the next 10 years I would like to see Herefords at the top but we have a lot of hard work to do between now and then. Queenslander Aleacea Nixon is the recipient of the CM Hocking Scholarship.